So yeah, it has been about a month since I did one of these. May was busy — it has been ever since I was in high school. Don’t ask me to do anything in May! Frankly, don’t ask me to do anything during the summer. Or maybe ever. I am busy. 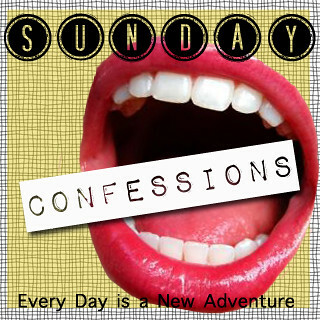 Sitting down to do these confessions is the most relaxing thing I’ve done today. It’s been one of those weekends where you are constantly running around doing stuff. Yesterday Rich and I went shopping for a new printer and then bought supplies for a woodworking project. Then we went to my parents’ house to work on the project. And we continued it today. Plus everything else that happens. I get annoyed when I feel like people aren’t paying attention to me — in person or online. If I am telling you a story, that means you should listen! I threw away a fudge pop this week. It breaks my heart to say it! But it had been in the freezer a while. I even tried to eat it, despite the gooey/melted/gross outside (that I rinsed off first). It was so grainy, and being a person who has issues with food textures, I couldn’t make myself eat it. I work better when I am in a time crunch. Knowing that I have all day to finish a project prevents me from finishing it. But if I have to be somewhere by 3 pm and I want to clean the bathroom, I am more motivated and I work faster to get it done. Perhaps I should just walk around with a giant timer around my neck. Something will be changing here at the blog soon. You’ll just have to come back and see, won’t you? I’m the exact same way about working with a time crunch – I’m a much better worker when there is one. Drives me nuts when I’m trying to tell a story and people are either or distracted or just not listening! I don’t blame you for throwing out that fudgepop… Once they’re all grainy they’re totally gross! I’m to the point where I don’t buy them anymore because I’ve had so many issues with them being all grainy straight back from the store! I also stopped buying them for a while. They were flavorless and slimy. It’s hard to find a good brand that is creamy and chocolaty! I’m with you on the procrastination front. I know I should get stuff done way before hand but that doesn’t happen often. Changes, you say? I’m curious.